Twenty years of opposition to restoration of Leonardo da Vinci’s "Last Supper"
Mario Donizetti, one of the leading figures in contemporary art, is considered the greatest exponent of realist figurative painting. In a documentary dedicated to him by CNN–International of New York, Elsa Klensch described the “timeless quality” of his art, which has made him famous all over the world. The scientific precision of his technical approach has led to his resurrection of varnished and glazed egg yolk tempera (the ancient secrets of which had been completely forgotten), his invention of a method for encaustic painting with an easel and his invention of the “encausticised pastel” (a radical transformation of the pastel with structural modifications to the method and materials). Despite these being absolutely personal and completely innovative techniques, they represent continuity with the great past of western art. This consideration is also remarked upon by Phyllis A. Tickle, who writes in her essay “Greed” (Oxford University Press, New York 2003) that “Mario Donizetti…more than any other contemporary artist has understood that new imagination must always go back to ask from its ancients the footings for its own work.…Saying that the destruction of the past leads to nothing but silence, he teaches that what must come next is a reverence for whatever is left standing out of what has been”. 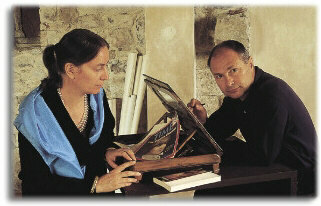 To divulge his techniques, and to complement the Centre for Research into Art Techniques (established in Bergamo in 1977), he founded an online Academy of Fine Arts (www.donizetti–museoscuola.it), which is based in Aquileia. He is the author of: “Forma e non Forma” (“Form and Not Form”, 1958), “Perché Figurativo” (“Why Figurative”, 1992, presented by Emanuele Severino), “Razionalità della Fede e della Bellezza” (“Rationality of Faith and Beauty”, 1995), “Lettera a Parmenide” (“Letter to Parmenides”, 1996), “Lettera a Platone” (“Letter to Plato”, 1997), “I Sette Vizi Capitali” (“The Seven Deadly Sins”, 1998), “Argomenti di Estetica” (“Arguments on Aesthetics”, 1999), “Lettera a Hegel” (“Letter to Hegel”, 2000), “Lessons on Art Technique” (2005), “Lettera a Phyllis” (“Letter to Phyllis”, 2007), “Il Sacro dell’Arte” (“The Sacred of Art”, 2011). In these writings, Donizetti uses the most recent scientific discoveries about the brain to demonstrate the groundlessness of artistic informalism, stating – as Jean Louis Ferrier metaphorically wrote in “Le Point” – that “Kant, Hegel, Croce ont introduit le ver dans le fruit de la réalité, à savoir, le subjectivisme” (Kant, Hegel, Croce have introduced the worm into the fruit of reality, that is to say, subjectivism"). Many renowned figures have posed for Donizetti, including Marta Abba, Jean Louis Barrault, Valentina Cortese, Rossella Falk, Giorgio Albertazzi, Vittorio Gassman, Marcel Marceau, Rudolph Nureiev and Gianandrea Gavazzeni (the portrait of Gavazzeni is at the Museum of the Scala Theatre in Milan). Several of his celebrated portraits – including the one of Pope John Paul II, which is now in the National Portrait Gallery in Washington – have been published on the cover of “Time” magazine. 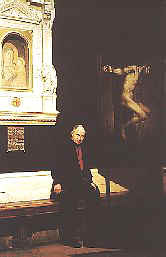 In 1983, he had the honour of staging an anthological exhibition of paintings and drawings in the halls of the Ambrosiana Picture Gallery in Milan. Some of his frescoes and an altarpiece can be found in the historical Abbey of Pontida. A dramatically powerful crucifix is in the Treasury Museum of St. Peter’s Basilica in the Vatican. The hundreds of anatomical drawings done from life have enabled the artist to develop a scientific knowledge of the human body’s structure and, therefore, an absolute plastic exactness in his works. His passion for music has led him to create a new method of music notation which eliminates the traditional stave. His works are exhibited in the showrooms of Costa Crociere ships ("Ritratti di giovani donne” [“Portraits of Young Women”] encaustised pastel, in the lounges of the Costa Luminosa; “Delizia Fisica e Delizia Intellettuale” [“Physical Delight and Intellectual Delight”], mixed technique: egg tempera, encaustised pastel, shellac, cm. 400x220, in the Hall of the Costa Deliziosa). Publications of note include the Monograph published by Fontes Ambrosiani (1983), the one published by Bolis, presented by Raffaele De Grada and Jean–Louis Ferrier (1991), the catalogue of the exhibition at the Palazzo della Ragione in Bergamo “I Vizi Capitali” (“The Seven Deadly Sins” (1998), presented by Vittorino Andreoli – Corponove Editrice) and the catalogue of the exhibition at the Rocca San Giorgio in Orzinuovi (2011) presented by E.Vezzoli, T. Zana, Maurizio Bernardelli–Curuz (Compagnia della Stampa Massetti–Rodelli Editori).